Apple in an update to a support document on Thursday announced initial macOS external graphics card compatibility with AMD's Radeon RX 560, as accomplished through Sonnet's Radeon RX 560 eGFX Breakaway Puck. Sonnet eGFX Breakaway Puck Radeon RX 560 now supported by macOS. Noted in a change to Apple's document covering eGPU usage with macOS, RX 560 compatibility arrives more than a year after support for the card was first tested in early beta versions of macOS 10.13.4 High Sierra. That point update was the first to deliver comprehensive eGPU support. For reasons unknown, Apple removed AMD's RX 560 from the list of cards supported by macOS 10.13.4 prior to the update's release in March 2018. Integration returned today as a "recommended" Thunderbolt 3 all-in-one eGPU solution. 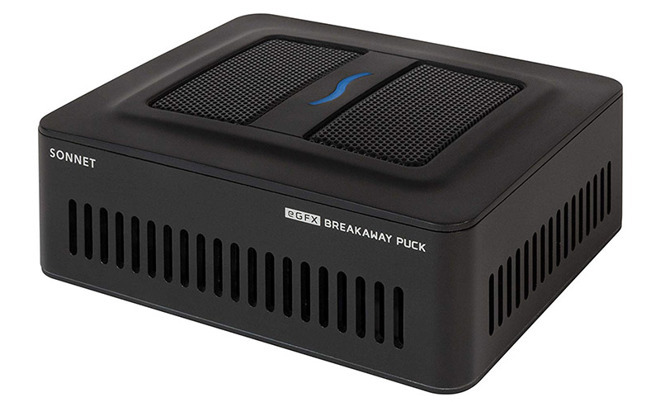 Specifically, Apple suggests the Sonnet Radeon RX 560 eGFX Breakaway Puck, a standalone device currently selling for $399 on Amazon.com. It appears that Mac users looking to boost their workflow with an RX 560 will have to deal with a few limitations. Apple notes playback of HDCP-protected content from iTunes and certain unnamed streaming services is not supported on displays directly connected to an RX 560-based eGPU, including Sonnet's device. Said content can, however, be viewed on the built-in display of a MacBook Pro, MacBook Air and iMac, the document reads. After an extensive beta testing period, Apple offered support for eGPU hardware with macOS 10.13.4, allowing users to accelerate graphics-intensive tasks like professional image editing apps, games and virtual reality applications. So what does this $399 RX 560 4GB w/TB3 box do that this $399 RX 580 8GB w/TB3 doesn't? I'd rather have a RX 580 8GB for the same price!!! I'm not a giant fan of either. If you're going to drop $400, get an enclosure and a discrete card. I'd rather see Nvidia support. I suspect these changes to macOS are more to do with upcoming new Macs than Apple caring about third party eGPUs. Of course, they could have their own if the new Mac Pro is modular. I've given up on Macs for gaming so I bought a high-end PC and I feel bad for those in scientific work that have applications requiring CUDA but I'd rather see an Apple GPU that knocks the ball out of the park in power, performance and lack of heat generation. It appears that Mac users looking to boost their workflow with an RX 560 will have to deal with a few limitations. Apple notes playback of HDCP-protected content from iTunes and certain unnamed streaming services is not supported on displays directly connected to an RX 560-based eGPU, including Sonnet's device. Said content can, however, be viewed on the built-in display of a MacBook Pro, MacBook Air and iMac, the document reads. So i assume the same restriction occurs with any third party enclosure+GPU card? Does this same restriction occur with the Apple-sanctioned BlackMagic eGPUs?